Two Accounts from Nigel Fenwick about his Involvement from the late 1950′s with the Bath/Braunschweig Twinning Association. Home » Events » Two Accounts from Nigel Fenwick about his Involvement from the late 1950′s with the Bath/Braunschweig Twinning Association. 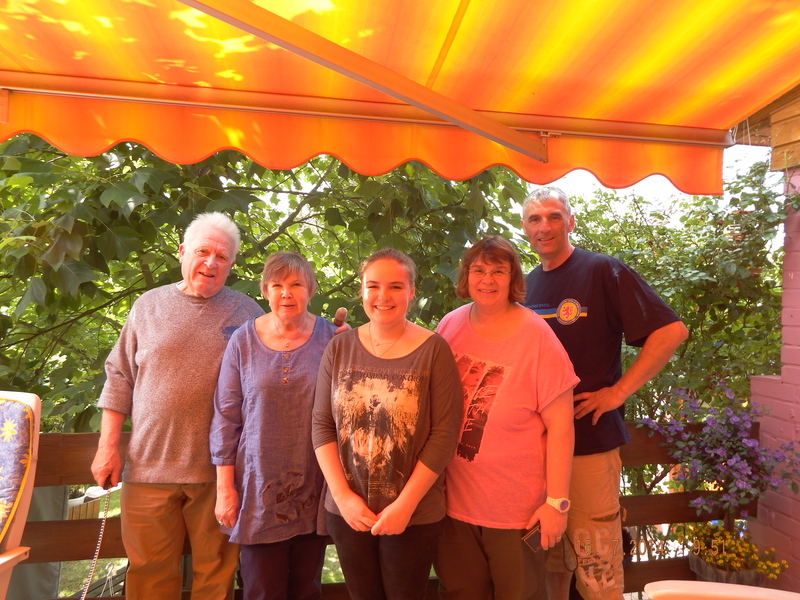 “I became involved with Bath/Braunschweig Youth Exchanges in the mid to late 1950’s, firstly hosting at our home in Bath and then visiting Braunschweig with a group in 1957 and then again in other later years. I joined the current Bath/Braunschweig Twinning Group just last year, being invited to do so by Hilary Elms after contacting her for help with my efforts to re-establish contact with two boys in particular – Horst Kroh, who stayed with my family in 1956 and Hans-Jürgen Reupke who’s family I stayed with, in 1957 in Braunschweig. Hilary has been instrumental in helping me with German contacts to assist with my search – Barbara Heck and Katrin Landsmann from the Braunschweig DEG Group, they in turn enlisting other help as required and/or appropriate in Braunschweig itself. They were local ‘officials’ who are called Stadt Heimatpflegers, appointed for the protection, preservation and continuation of standing traditions. Katrin in particular has been the most enthusiastic, diligent, thorough and indefatigable help in successfully tracing Horst and Hans-Jürgen. Hans-Jürgen and I have re-joined contact through eMail and unfortunately although traced, Horst had passed away some years ago. A very bittersweet result if ever there was one! It is entirely on the cards for me to follow up the above reported exercise with a brief return visit to Braunschweig, possibly in July this year. 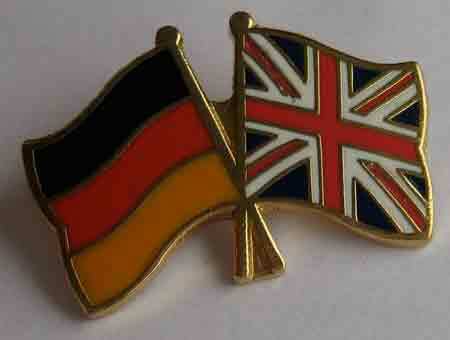 “ I visited Braunschweig as part of Bath youth group exchange visits during the latter part of the 1950’s. In 1956 my family hosted a boy from Braunschweig called Horst Kroh and the following year I visited Braunschweig and stayed with Hans-Jürgen Reubke’s family on the Gifhorner Straße. Over the last few years, following my retirement, I made attempts to trace Horst and Hans-Jürgen with a notable lack of success until I tackled my tracing difficulties via the Bath & Braunschweig Twinning Association and in particular Hilary Elms. Hilary has been of the most invaluable support and practical help with all the contacts through whom I eventually traced the two German boys. The Braunschweig contacts approached in my search quest were, Treve Erdmenger, Barbara Heck and Katrin Landsmann. The search result(s) were a bitter/sweet experience with Hans-Jürgen alive, well and still in Braunschweig, but Horst having died some two years ago, aged 70. As a direct result of rediscovering Hans-Jürgen and his whereabouts, I decided to visit Braunschweig and re-establish contact with him and his family. This trip has taken place in July this year and took the form of a return car journey from Bath to Braunschweig – Bath to Dover (200 miles) – Sea Crossing to Dunkerque (Loon-Plage) – Dunkerque to Gladbeck (236 miles) – Gladbeck to Braunschweig (188 miles) – The return from Braunschweig to Dunkerque was a single trip – All in all the continental journeys were bearable, except for the volume of heavy lorry traffic on week days! 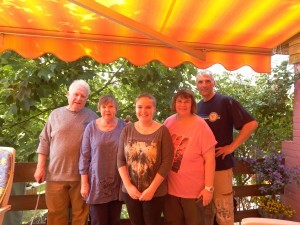 Whilst in Braunschweig my wife Libby and I had a most enjoyable brunch meeting with Katrin Landsmann plus most of her family and a delightful evening meal with Barbara Heck & Carmela Folgosa. We also visited Hans-Jürgen and his wife, who had their grandson Nicholas on hand to act as a most successful interpreter. We stayed at the Braunschweig Mercure Atrium Hotel during the duration of our visit and can thoroughly recommend this fine hotel for comfort and excellent service (they also take pets). I am very pleased to have been able to make this nostalgic trip, although understandably sad concerning the passing of Horst Kroh – Thank you again to all who helped and contributed to the success ultimately achieved in making the trip possible and an old man happy. 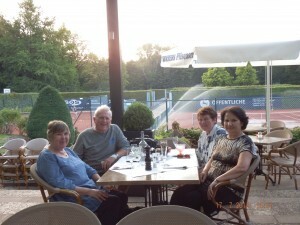 from left: Libby and Nigel Fenwick enjoying an evening meal with Barbara Heck and Carmela Folgosa.